WooHoo! I was pumped to see this added to the ShopCrackBerry.com store and just had to make a quick blog post about it. For all you Curve users out there who use your 8320's WiFi or 8310's GPS a lot, you'll really appreciate this... Seidio's 1500mAh Battery for the Curve. It's the same physical size as the battery that ships with your Curve 8300/8310/8320, but provides approximately 35% more power/battery life. This battery is great for those who are on the go and do not have access to an external charging alternative. Since this battery is compatible with the original OEM door, no extra thickness will be added to the phone. The 1500mAh battery is available for preorder now, and should start shipping in the next couple of days. 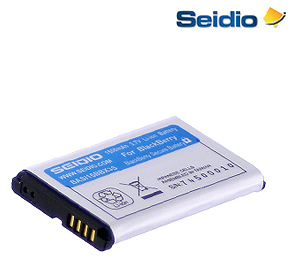 And if you still need more power, don't forget we also have Seidio's 2600 mAh Extended Battery for the Curve. This has LOTS of power, but it will add some size to your Berry (extended battery cover comes with it). Not using a Curve? We have lots of battery options in the ShopCrackBerry.com store for all models of BlackBerry devices.